Quatuor Coronati is the world’s premier research lodge. Established in 1884 and consecrated in 1886, the lodge’s founders wished to advance an evidence-based approach to the study of Masonic history and research into the origins of freemasonry. Their approach was intended to replace the more imaginative writings of earlier authors and was referred to as the ‘authentic school’ of Masonic research. Quatuor Coronati adopts the same principles today. We hold meetings incorporating lectures five times a year, usually at Freemasons’ Hall at Great Queen Street in London; publish our lectures, other research papers, and ‘notes & queries’ in Ars Quatuor Coronatorum – ‘AQC’, the annual Transactions of the Lodge, which is distributed internationally; arrange conferences and symposia on different aspects of freemasonry; and share our research and encourage scholarship via the QC Correspondence Circle – ‘QCCC’ – established more than 130 years ago. Whether you are based in North America, Latin America, the UK, Europe, Africa, Asia, Australia or New Zealand, we would be delighted if you would like to become a member of the QC Correspondence Circle. QCCC is an international community and is open to everyone interested in Masonic and historical research. What a fantastic Conference! 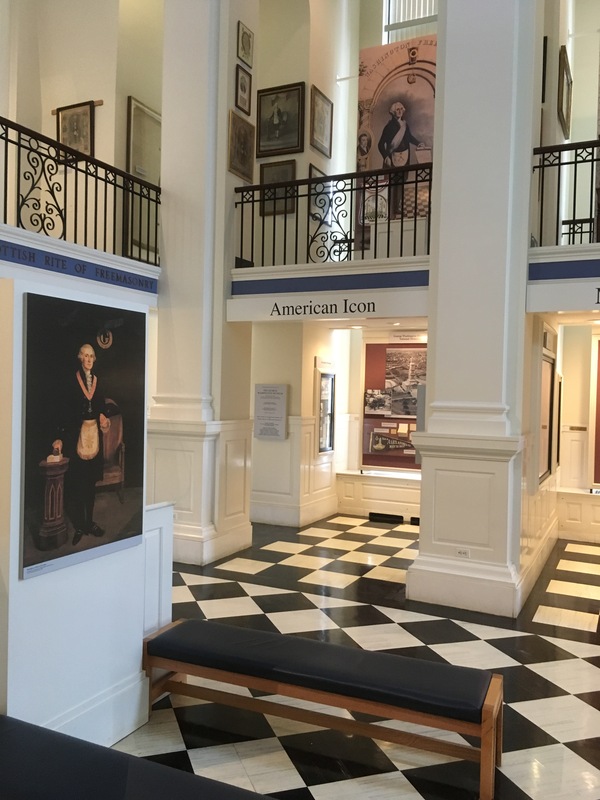 The George Washington Masonic National Memorial in Alexandria, VA, proved to be an outstanding venue for Freemasons in the Transatlantic World, our American Conference. 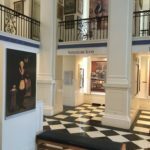 Some 180 delegates attended and more than twenty papers were delivered covering transatlantic themes in eighteenth-century freemasonry in America, the Caribbean and Europe. The dinner at Theismann’s was exceptionally good, as was the Universal Lodge demonstration organised by Akram Elias, PGM, Washington DC. Click on the links to read the conference reports in the Winter editions of Freemasonry Today and Philalethes. Our thanks and congratulations to all those involved, especially Ric Berman, James Campbell, Jon Shelton, Susan Sommers, Mark Tabbert, Tyler Vanice, and all our speakers. And special thanks to MACAL and MESH for their generous support, and to George Seghers and the team at the GWMNM. The Transactions comprising the papers delivered at the Conference is now available for pre-order. Please click here. More information is available at ‘Recent Symposia‘. We have been encouraged to organise another American Conference in 2020, so watch this space! Check your membership status by going to Find My Account. If you have not done so, you may need to Register; an automated email will confirm your membership / subscriber number and you can log in using that information. If your membership commenced after 30 November 2018, you will receive AQC 132 at the end of this year. If you are missing a recent edition of AQC, we have a small stock available, including AQC 131 (covering the year to November 2018). These can be purchased online by clicking here. If you have any difficulties with your subscription, please let us know by emailing subscriptionsmanagement@warnersgroup.co.uk referencing QCCC and giving your subscriber number; please copy queries@quatuorcoronati.com so that we can follow-up as required. Please tell us if you change your email address. Your email is used to confirm payment details and to preserve security this information can only be changed by the subscription manager. QC and QCCC flyers and brochures can be downloaded by clicking on the links on the Local Secs webpage. QC’s Research Resources contains facsimiles of and introductions to a number of important Old Charges and Masonic Manuscripts, plus the early Minutes of the Grand Lodge of England (‘the Moderns’), and the early Minutes of the Grand Lodge of England according to the Old Institutions (‘the Antients’). The website also contains indexes to past volumes of AQC, Book Reviews, and many sources of further information. Our research service for QCCC members can be accessed here. Recent back issues of AQC can be purchased online. Just click here. It is notoriously difficult to avoid errors in updating and maintaining websites. If you spot a broken link or another fault, please email queries@quatuorcoronati.com. Thanks! Under the General Data Protection Regulation all societies need to give their members an account of the personal details they hold and the use to which they will be put. So: we hold your name, address, email, phone number (where supplied), date of joining and method of payment on a database maintained securely by Warners Group Publications plc on our behalf. We use this information for the purpose of communicating news of upcoming events etc., for general communications with members, to facilitate subscriptions and renewals, and for accountancy/audit. The information held on each member can be viewed by that member once they have registered and is open to amendment by such member. No details are released to any other organisation. A copy of our current subscriptions data retention and disposal policy is available by emailing us at queries@quatuorcoronati.com. Join or Renew your Membership of Q.C.C.C. Your support will allow us to extend the research material and research services currently provided. Thank you. The Correspondence Circle exists so that as wide an audience as possible may enjoy and benefit from the research efforts of Quatuor Coronati Lodge, the premier Masonic research Lodge in the world.